When I was at Global Pet Expo 2014, I found this unique product in the "What's New" section. 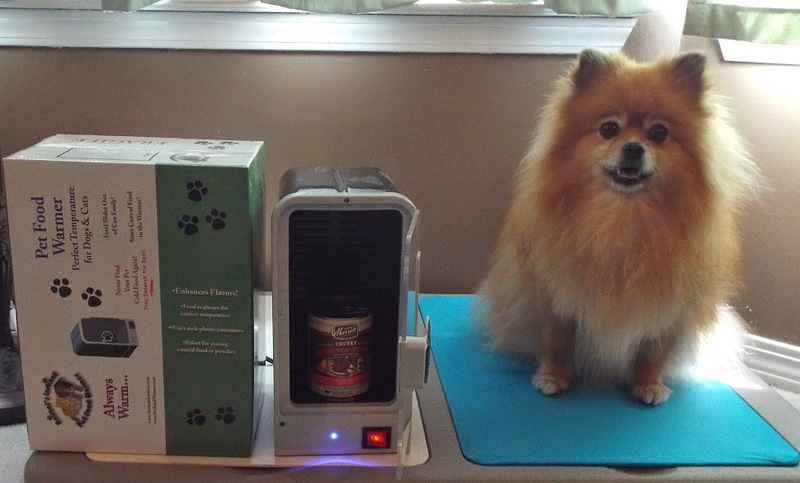 It's the Animal's Instinct Pet Food Warmer. I've never seen a pet food warmer before. Naturally, I had to get a closer sniff. What does it do? 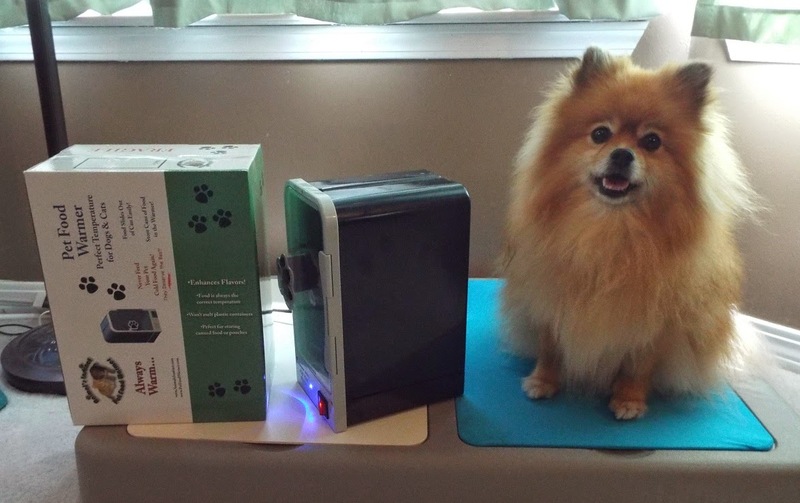 The Animal's Instinct Pet Food Warmer heats the food slowly overnight (8 hours is the ideal amount of time). The food is warmed to normal pet body temperature: 102*F. This is the serving temperature that cats and dogs find most appetizing and natural. The scent of warm food helps to entice picky eaters to eat their food. I'm sure my kitty pals know what I'm talking about. It is easy to use. Your human plugs it in, turns it on, and stores your unopened cans, trays, or pouches of wet food inside it. You can also use it for warming food toppings or mixers. 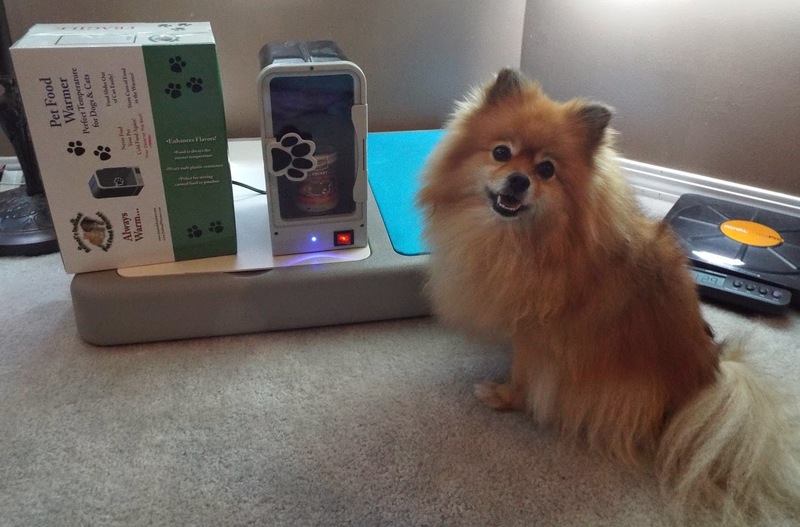 Now your food is always ready to eat, and it is at the pawfect temperature. Your human will appreciate how easy the warm food and gravy pours out instead of needing a spoon to scrape the can. 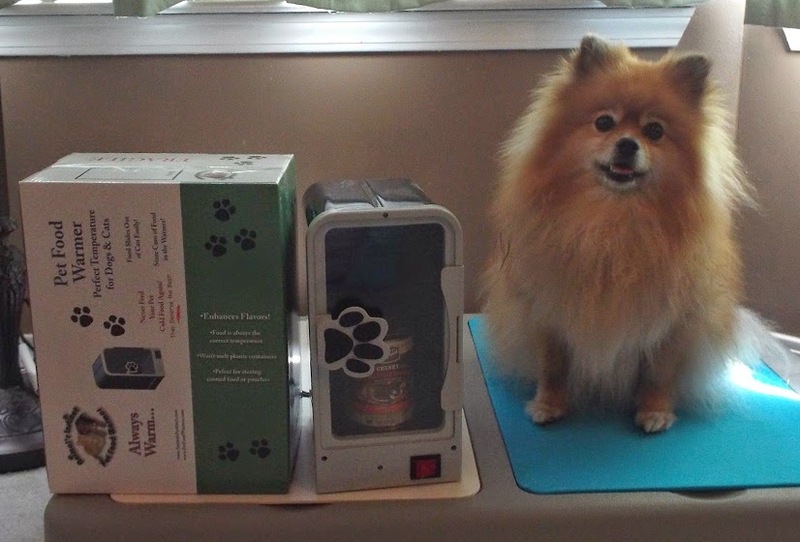 The Pet Food Warmer is not designed to reheat refrigerated food, store opened food, or thaw frozen raw food. If you can't eat a whole can or tray at once, then you will need to store the leftovers in the refrigerator. Unfortunately the microwave or stove are still the only way I know about to reheat refrigerated food. Then I have to wait for it to cool down because the microwave makes it too hot. The Door is open, is it time to eat now? Shhhh! I have a little secret to confess: Mom experimented, and did a "not recommended use". Mom put the refrigerated wet food in a covered metal dish inside the pet food warmer for a few hours before dinner. It worked, the food wasn't cold, and I didn't get sick. She also used it to thaw a frozen raw meal one day when she forgot to thaw it the night before. She put the nugget in a metal dish and put it in the warmer for about an hour. Mom decided to try it instead of thawing on the kitchen counter-top. It worked, but was only a little faster than the counter-top method. Let's be honest, even a few minutes is worth it to a hungry dog - and the human who has to listen to it barking. BOL! Amazing! Never thought of such a thing! OK...if anyone could find a pet food warmer at Global, it would be you Pepper! BOL I didn't even see that. I am glad to hear that even though not recommended, you could warm wet food that had been refrigerated. I know many dogs who do not like to eat cold leftovers. I'm glad you broke the rules and tried what you did! To me, if you can't warm refrigerated pet food in it, then what's the point? Food that is in the cans and not refrigerated is already a good temp so I would want it to heat from the fridge. Thanks for the honest review! Nice to know there is something like this out there available to the general public. I never liked feeding directly-from-the-fridge foods to the Dallys and certainly won't even try it with the panfurs that are now here.